Truth is we didn’t know what to expect. But we found out what happens when heavy metal meets classical sensibilities. One critic described it “like a cello smacked upside your head” when the Portland Cello Project recently performed music from heavy metal’s Pantera–eponymously dubbed, A Vulgar Display of Power. We stood fanny to fanny with 30-somethings celebrating the 20th anniversary of the heavy metal album, the cellos pounding out the rhythm while some in the audience shouted the lyrics: RESPECT! WALK! 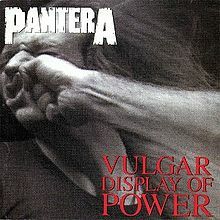 A Vulgar Display of Power frontlines music that would be inaccessible to someone like me. But in the hands of the Portland cellists, the heavy metal tunes not only rocked, they informed. Be yourself. Respect. The classical musicians accomplished for heavy metal what Dolly Parton did for country music: they mainstreamed the ineffable. The “surging grooves” resonated with the cellos, and the musicians revealed the mellifluous qualities of heavy metal, eschewing guitar riffs that would typically pierce your frontal lobe like a hot stick. Kudos to the Portland Cello Project for keeping the experiment fresh. This entry was posted in censorship and tagged literacy, rhetoric. Bookmark the permalink.